Most moms would agree with me that the best kinds of adventures with Littles are the ones where they are free to investigate and discover while honestly just being kids. Not having to rein your toddlers in is key to enjoying a day out with friends or family. This is why we love exploring museums set up just for children! They are a great mix of educational and fun with their come play to learn attitudes. The Mayborn Museum Complex at Baylor University in Waco, Texas was flat-out impressive! This amazing complex combines a discovery center, natural science center, and also a cultural history museum; there is literally something for everyone! The first aspect of the museum that needs to be mentioned is the staff. They were attentive and helpful while also blending into the background. I almost never noticed them unless I needed something and then they seemed to be all over and willing to lend a hand. Everyone was knowledgeable not only about the facility but also the exhibits. We were very grateful for their guidance along the way and from the beginning, we knew we could rely on each staff member to make the trip enjoyable! 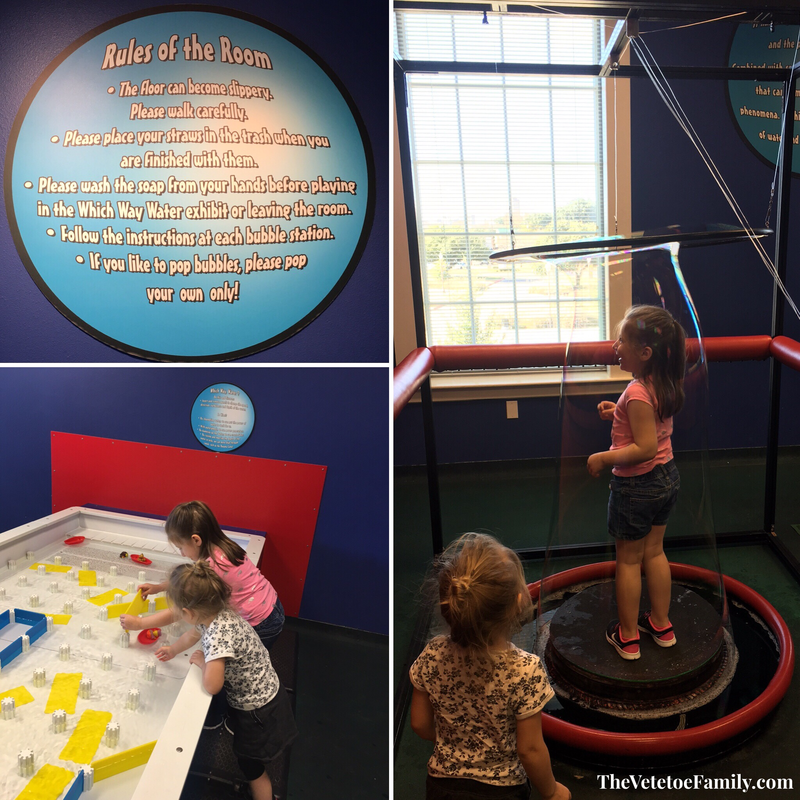 Having four kids ages five and under with us, we immediately headed to investigate the Harry & Anna Jeanes Discovery Center where there are seventeen themed rooms for hands-on and interactive learning. Aunt Blanche’s Tea Room: A quant little room filled with child-sized tea room décor, miniature tables, dress up clothes, fake foods, and tea sets! Communication: This room has all types of communicative devices from ancient hieroglyphics, early printing presses, modern telephones, and everything in-between. Energy: Filled with informational diagrams, light switches to test the effects, and models explaining how electricity works, this was our family favorite. Health: This area was all about our bodies and keeping them healthy. Outside of the room is a large, walk through heart featuring some neat details. Mrs. Moen’s Neighborhood: An adorable area where you can find all the neighborhood related themes! Native Americans: Complete with a small table for grounding corn and a teepee to explore, this area is all about honoring the original habitants of our nation. Optics: Light tables make up the majority of this room where the littles learned about vision and reflections. People of the World: One of the largest of the dress-up rooms, there were sections for each country or area of the world with explanations of how the originating people are unique. Pioneers: This room takes the visitors back to the day of covered wagons, washboards, and small schoolhouses! Recycling: With a giant model of how recycling works and where our garbage goes, this room is perfect for explaining why our impact on the world is so important. Simple Machines: Pulleys, levers, and cranks make up this simple yet exciting room. Sound: A sound booth and walk-across piano are the main features in this music-themed room while there are also instruments and radios the intrigue the kids. Transportation: Main features include a school bus, jeep, and fire truck for role-playing complete with costumes making their roles that much more realistic! TV News & Weather: Littles who visit this room can watch their friends on the small television anchoring their very own weather report. Setup with a direct feed camera, this room is a lot of fun! Vertebrates & Invertebrates: Living display cases show off all types of creatures along with their natural habitats with our favorites being the butterflies. Water & Bubbles: Simple but perfect for little ones who love to splish and splash, this room features a water race and a bubble stand! A little insider tip: Want to delve even deeper into the learning experience? Are your littles ones absolutely fascinated by the butterflies on display with a questions galore? A very neat addition to the museum is the cell phone audio tour which brings a whole new dynamic to the tour. Simply call into the museum line and enter the prompt on the exhibit to hear more about display! There were several classes going through some of the stations upstairs so we were able to observe their field trip atmosphere which was phenomenal. There was a lot of information presented in each room but at the perfect levels for the kids to really relate. All of the children were constantly engaged, asking questions, and genuinely intrigued by their guides’ presentations. I loved seeing the light bulbs going off in their minds! Our kids had a blast in all of the Discovery Rooms but their favorites seemed to be Water and Bubbles, Energy, Pioneers, Aunt Blanche’s Tea Room, and Sound. The reason for their love for the Water and Bubbles room seems obvious… The loved being inside of a bubble! For those who know our family fairly well, you know that my husband is a Power Lineman. This means that our kids tend to gravitate towards anything electricity related and that proved true as their eyes lit up when faced with the buttons, switches, and light bulbs in the Energy room. Dad would have been proud! Next, the Pioneer exhibit, oh my. This was the one room in the entire building where they went absolutely crazy with joy! They dressed up as cowboys and ladies while collecting eggs, holding class, milking cows, driving the wagon, and so much more! This area stopped us dead in our tracks for a good play session filled with imaginative adventures and over the top tales of the Old West! Aunt Blanche’s Tea Room was just as fanciful as we shared tea, cookies, and biscuits while wrapped in the height of feather boa fashions. Even Mr. Man decided he needed to an invitation to this otherwise all girls event. Overall, the whole visit was a success. The kids had an amazing time while we moms got to relax and enjoy our Littles doing what they do best, learning through play. I would definitely recommend expecting this to be a two-day visit! We were a bit sad we were unable to explore their Natural History Museum in all of its glory but we did get a few moments to quickly browse. We also peeked in at their current traveling exhibit, All Aboard the Mayborn Express. This incredibly extensive model railroad collection is an annual event and the size is definitely no joke. Lasting from late fall through January, this would be a wonderful experience for anyone who has a passion for railroading! Pricing: View ticket information, schedule a group tour, or look into memberships. Our group was provided complimentary admission on behalf of Baylor University and Mayborn Museum but all opinions expressed are honestly based on our own experiences.